I want to continue the discussion of high performance/low maintenance perennials that I began in December. So, onward. I’m sure you’ve heard the tongue-in-cheek definition of a perennial, i.e. a plant that blooms each year, assuming that it survives the winter. If you select perennials or biennials that reseed, it doesn’t matter if the mother plant survives because there are always lots of babies. This would not be a choice for neatniks but I love the fact that the number and location of the babies is a bit different each year. It’s also a way of making a garden look more natural. After all, Mother Nature does not plant in rows or squares; she plants in drifts and weaves her underlings into lovely patterns. 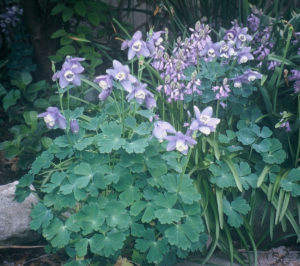 Aquilegia flabellata ‘Nana’ is a dwarf with bluish-green foliage. Aquilegia ‘Ruby Port’ is a double. Doubles seem to seed the most freely. Aquilegia (Columbine) is a prolific reseeder and there are so many forms, colors, and cultivars from which to choose: singles and doubles plus every color in the rainbow plus some bicolors. 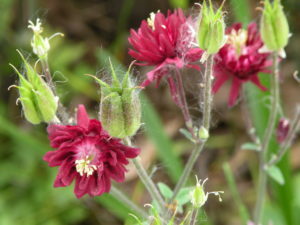 It blooms in May and June and will rebloom if deadheaded. The attractive seed pods look like inverted, dried bells. When they open, you can easily see the black seeds. If you prefer not to leave the seed distribution to Mother Nature, you can break off the pods and broadcast the seeds yourself. Even when not in bloom, the lobed foliage is very attractive and provides an unusual form that contrasts well with linear and ovate foliage. This section of the garden is filled with Echinacea purpurea, Achillea ‘Coronation Gold’, Perovskia and, Miscanthus. If you haven’t already compiled a list of low maintenance perennials, visiting public gardens can be an eye opener. Most of these gardens have very low budgets for maintenance so the plants that are used must be ones that need only minimal maintenance. 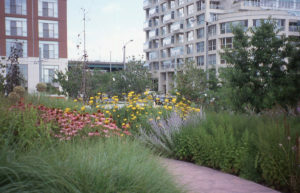 For instance, the Toronto Music Garden, designed by Julie Moir Messervy, has large sweeps of perennials and grasses that look good all year and bloom in succession from June to November. This bed is still full of color in October. 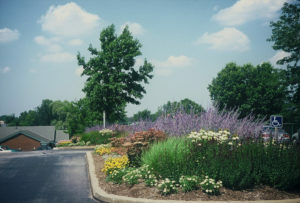 Another example of a high performance/low maintenance landscape is one I designed many years ago for the city of Brecksville police department parking lot. It also needed to be a xeriscape since the bed was not irrigated. 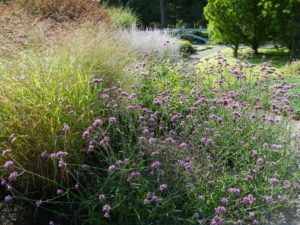 I filled it with Leucanthemum superbum ‘Becky’, Origanum laevigatum ‘Herrenhausen’, Pennisetum ‘Hameln’, Sedum ‘Matrona’, and Perovskia. Next time, I’ll give you several examples of high performance/low maintenance ornamental grasses.